In my experience, the biggest factors which drives a company toward either a relentless focus on their core business or a penchant for adding new businesses is the background, personal experiences and attitudes of the CEO or founders. It really depends upon what these folks are used to and comfortable with. A CEO who came up through the finance function and has had exposure to a lot of acquisitions or even roll up platforms, tend to continue that approach when they become a CEO. This is regardless of whether or not that may be the most appropriate thing for the company they are leading at that time. “Deal junkies” from all functional areas usually fit the same profile and lean toward business diversification. Conversely, a CEO who came up through the product development function might identify closely with a specific type of technology or market; as a result the company strategy may stick closely to that core business – come hell or high water. What stage is your company (and products) in it’s lifecycle? This may indeed be the most important questions of the list to ask yourself. If the company is currently in a period of high growth and everyone is running hard, execution is critical. Any discussion of business diversification efforts can be very difficult in these circumstances. This is sometimes unfortunate, because it is usually best to be planning for the next growth driver BEFORE the current one has run it’s course. But taking your eye off of the execution ball at such a time can also be quite dangerous. So this can be a real balancing act. Strategic planning really needs to be done with a long term view, so it’s best if you can at least find the time for a discussion of “what comes next”. But in many if not most cases if you’re growing nicely and can see adequate opportunities in closely adjacent (and therefore low-risk) technologies/markets it may be best to continue your focus. Only once you believe that the runway for your current technology or addressable market is ending, does it usually make sense to consider major diversification efforts. How horizontal or vertical is your IP/Technology? The more horizontal your hardware or software technology is, the easier it will be to diversify your tech company’s revenue streams successfully. 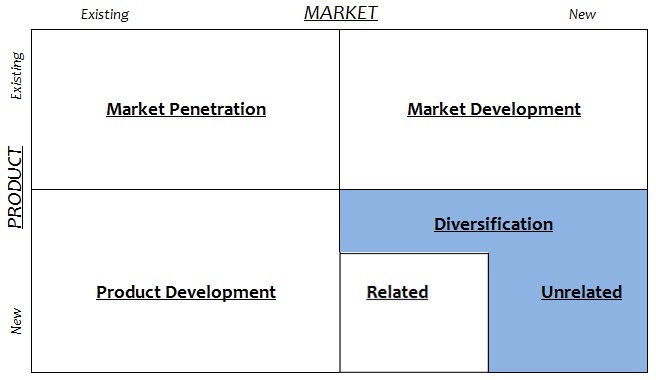 If to-date you’ve built upon IP and market knowledge that is extremely vertically focused and doesn’t appear to be directly transferable, a lot of risk is added to any diversification activity. Many times the underlying technology in a highly focused, vertically oriented traditional software, SaaS or hardware company is nothing special compared to what exists in other market segments. The differential advantage in these cases is often the customization of that commoditized platform for the target vertical segment. This competitive advantage doesn’t translate well to other market segments. Be careful to do an objective analysis of this horizontal vs. vertical question before you plunge into business diversification. Is there excess capital for business diversification or core activities? Oftentimes it’s a large excess of financial resources that leads a management team to seriously look at business diversification. Of course, this can be “fools gold” if it causes you to get itchy and invest the money in an unwise manner. The first order of business should almost always be to dedicate the amount of money – no more but no less – necessary for continued success in the company’s current core business — however you define that. Make sure that you can do that first. If you can’t, in almost all cases any thoughts of diversification should be delayed until the circumstances change. Once that is done, then it’s important to decide how to get the best return on this committed capital. In many cases, the best risk/reward move is to put it into something safe like low risk bonds, because it keeps you from getting too aggressive in diversification. Some people don’t won’t let money burn a hole in their pocket, which can lead to reckless diversification. Any business diversification effort should be done cautiously and as systematically as possible, due to the inherent risks. Optimal ROI in your current business with all resources deployed? This is a question that relates to the size and resources available to you, versus the size and attractiveness of your current market. I’m not just talking about money here; but also overall talent, depth of your management bench, promising IP/technology which has not yet been deployed and the company’s brand reputation in the market. As an example, if you have started in a small vertical market and are “killing it” with a company that actually has the resources to do much more, you may not have the luxury of maintaining a focus on this current core market for very long. This is a phenomenon which explains why large, multi-billion dollar technology corporations might not even blink at ignoring potential market opportunities of less than $1B in sales. Because it won’t move the needle on its financial results, no matter the level of success. For a younger company that is starting out in a market that is “too small” to support them in the long run, this is even more problematic. In both cases, diversification may be a necessity rather than a choice, if strong growth of the business is to continue. The converse of this is if you are in a market that you’re just able to scratch the surface of with your current level of resource, it only makes sense to stay put and continue your focus on the core business. Are your results waning, even with good current execution? Sometimes it just feels like you’re reached the “end of the rope” in your current market segment. It may be that you’ve just “run out of room” to grow due to a large market share or small market size. Or on the other end of the spectrum, you’ve never really been able to compete successfully enough with dominant players in the segment to reach a profitable share. Sometimes, it just feels like you have to move on and “re-invent” the business. Hopefully you are able to do this in a fashion whereby at least some of the companies core competencies (management skills, technologies, processes, etc) appear to be transferable to the new business area, as this will reduce risk. But sometimes diversification is inevitable and MUST be done if the company is to be a going concern in the long run. This is really the one exception to the advice I provided above on focusing on your core business if the company really doesn’t have excess financial or other resources. All good things come to an end not (and sometimes, unfortunately, they never get started); realizing this situation and taking decisive action toward business diversification, regardless of the perceived risks involved is essential. Sometime not taking bold action is the most risky strategy of all. How do you approach the inevitable focus vs. diversification decisions that pop up in nearly every business? Fill us in on your thoughts with a comment below.